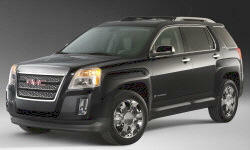 GMC Terrain Exterior Styling Pros and Cons | Page 1 of 1 | Why Not This Car? Many people dislike the new Jeep Cherokee's face, which oddly positions the headlights below the marker lights (which most people will mistake for headlights) and above the foglights. The wife's car. She loves the looks. Styling drove the Terrain buy over a Chevy Equinox. The truck is sharp and sleek, truck like yet stylish. The squared wheel wells gives it a unique look. Looks manly, but not intimidating.